A cat that wandered into a Fife rescue centre with a can stuck on its head has left staff wondering how it reached them without being knocked down. The female cat walked into the Scottish SPCA's Wildlife Rescue Centre in Middlebank on Sunday with her head wedged in an empty pet food tin. After the can was carefully removed she was checked over. She has now been taken to the Edinburgh and Lothians Animal Rescue and Rehoming Centre in Balerno, Edinburgh. 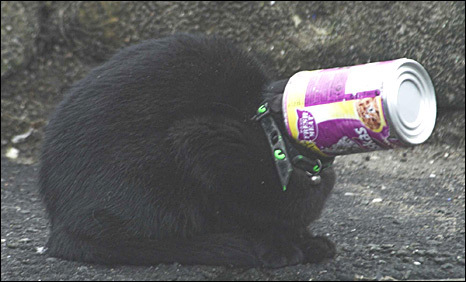 Colin Seddon, Scottish SPCA Wildlife Rescue Centre manager, said: "Luckily no damage was done and the little cat was very pleased to be freed from the discomfort that comes with having your head stuck inside a tin can. "We think it's likely that she was scavenging and came across this discarded tin of cat food. "She may have got the can stuck on her head and then became disorientated, it's lucky she wasn't hit by a car." Mr Seddon added: "This only illustrates the fact that litter can pose a threat to both wild and domestic animals and we always encourage people to make sure they bag and bin their rubbish, it could save an animal's life." The cat was wearing a distinctive collar printed with green cat's eyes.